When Kelly Galloway speaks of her product that monitors septic systems, it doesn’t take her long to outline her plans for an Internet of Things solution that will automatically protect homeowners from the horrors of reversing septic tanks. Galloway is the President of Stratford, P.E.I.-based Engineering Technologies Canada Ltd., which later this year will release its patented Septic Sitter system. By the time it launches, the product will be capable of alerting homeowners (or their proxies) through their smartphone or mobile device of a problem with their septic drainfield. ETC is now testing the product on a couple of P.E.I. sites and hopes to have the product ready for early adopters by late summer. Galloway believes the time is right for Septic Sitter to find strong demand. “The big thing I find that has changed in the last five years is the proliferation of [smartphone] apps … and the development of smart devices in the home [like Nest],” said Galloway in a phone interview. ETC and the Septic Sitter product were in the news on PEI recently because it was one of five companies selected to receive up to $100,000 from Innovation PEI’s Development and Commercialization Fund. The government agency will cover the company spends on development and commercialization up to a maximum of $100,000. The prize is just the latest step for Galloway, an engineer who specializes in the design, installation and maintenance of septic systems. She developed Septic Sitter to use technology growing in acceptance (sensors and smartphone apps) to make sure people operate and maintain their septic systems properly. 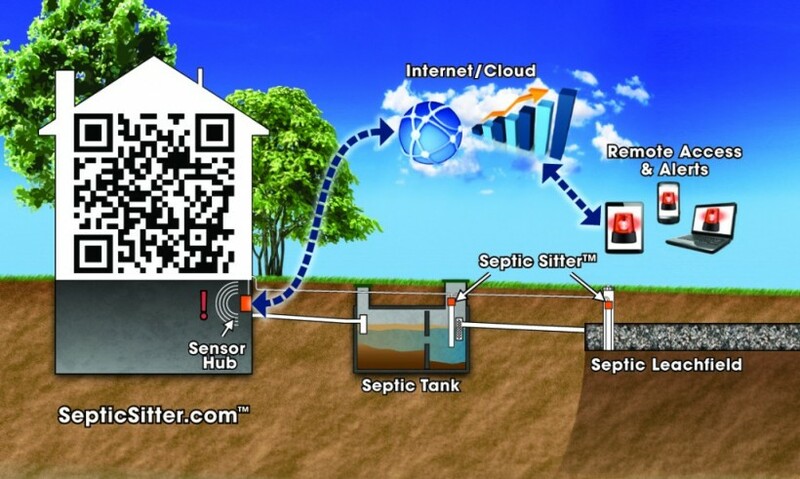 Septic Sitter – whose tagline is “Peace of mind for your behind” – places sensors in a septic tank’s drainfield, the underground area that catches the runoff from the tank. The sensors send readings to a sensor hub in the house, which can assess whether there is unusually high runoff and keep a record of flow in the drainfield. It sends an alert to a mobile device whenever the flow is at dangerous levels. If there is a sudden expansion of flow from the septic tank, the homeowner can take measures like reducing washing machine use or repairing toilet flapper valves before there’s a catastrophe. The record can also be used when selling a house to demonstrate the septic system is in working order. Galloway said some people believe their systems will be fine as long as they pump the tanks regularly. But other problems can occur regardless of the usual maintenance and Septic Sitter helps to prevent these. The exciting thing about Septic Sitter is what the later generations will be. ETC is working on an Internet of Things product in which septic sensors can detect high levels or flows and instantly correct any number of sources to make sure it shuts down. It might automatically shut off a dishwasher or make sure a leaky toilet stops flushing. The company is already being featured in a futuristic glimpse of online capabilities. Austin, Texas-based Freescale Semiconductor has an educational tour called the Internet of Tomorrow Tour, which has been traveling the U.S. since last October. And Septic Sitter is featured in this traveling roadshow. The product was also showcased recently at the 2015 Water and Wastewater Equipment Treatment and Transport Show in Indianapolis, and Galloway said the product received glowing feedback. Disclaimer: Entrevestor receives financial support from government agencies that support startup companies in Atlantic Canada. The sponsoring agencies play no role in determining which companies and individuals are featured in this column, nor do they review columns before they are published.